Campers availing medical assistance at the ongoing three-day combined ‘Fathers Camp’ organised by Razeba Baptist Church (RBC) and Zelome Baptist Church (ZBC) at Bisho Koide in Maram, Manipur. 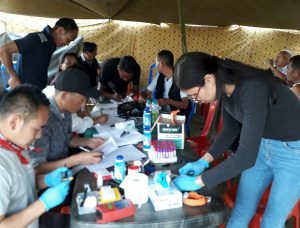 Dimapur, April 13 (EMN): A total of 48 campers were administered medical check-up on the second day of the three-day combined ‘Fathers Camp’ organised by Razeba Baptist Church (RBC) and Zelome Baptist Church (ZBC) at Koide Biisho under Senapati district, Manipur. 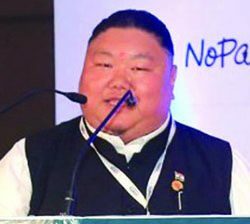 The camp was organised by the men fellowship department of the Chakhesang Baptist Church Ministers’ Hill Kohima (CBCMHK) on the theme “Stand firm in the faith, be men of courage” (1 Cor. 16:13-14). The day was marked with free medical camp conducted by Dr. Vinotsole Hiese and Dr. Poseta Nyekha along with some technical staffs from NHAK. Altogether 48 campers were treated of different ailments. During recreational hour on Day-2, Nehemiah group won both the football and Tug of war competition events. A press release issued by the camp media coordinator, Kuzhovesa Soho, stated that all the 95 registered campers are harvesting spiritual fruits till date. The organisers further sought the prayer support from all believers for the successful outcome of the camp.